Through the power of oxidation Green Clean granular algaecide breaks down algae cells on contact, you can see it working! Its unique organic chemistry immediately begins fighting algae blooms and releasing vital oxygen into the water as it biodegrades. It can be used as a curative or preventative treatment in any water feature, including those that contain fish, plants and other aquatic life. Formulated without the use of harsh chemicals or chlorine you are ensured there wonÍt be any negative effects to the aquatic ecosystem. 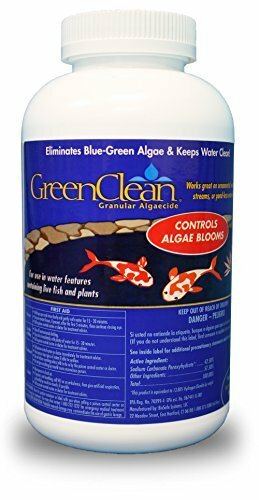 Green Clean granular algaecide is effective and offers immediate results when eliminating blue, green and string-algae. With an environmentally sound chlorine, copper and phosphate-free formula you can even have confidence using Green Clean granular algaecide in water features without circulation systems. For best results, apply in the morning hours of a calm sunny day when water temperatures are warm. Sunlight and higher temperatures will enhance Green Clean granular activity.